If you’re a gardener in the United Kingdom, how do you interpret gardening information that relies on USDA plant hardiness zones? How do you compare UK hardiness zones with USDA zones? And what about RHS zones and hardiness zones in Britain? Sorting it out can be a challenge, but understanding zone information is important because it helps you select plants that have the best chance of surviving in your particular climate. The following information should help. USDA (U.S. Department of Agriculture) plant hardiness zones, based on minimum ten-year average temperatures, were created in the 1960s and are used by gardeners around the globe. The purpose of the designation is to identify how well plants tolerate the coldest temperatures in each zone. USDA zones begin at Zone 1 for plants that tolerate severe, sub-freezing temperatures to tropical plants that thrive in Zone 13. 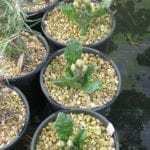 RHS (Royal Horticultural Society) hardiness zones begin at H7 (temperatures similar to USDA Zone 5) and are used to designate very hardy plants that tolerate sub-freezing temperatures. On the opposite end of the temperature spectrum is zone H1a (similar to USDA zone 13), which include tropical plants that must be grown indoors or in a heated greenhouse year round. Does Britain Use USDA Hardiness Zones? While it’s important to understand RHS hardiness zones, much of the available information relies on USDA zone guidelines. To get the most benefit from the wealth of information on the Internet, it’s a tremendous help to arm yourself with information about USDA zones in Great Britain. 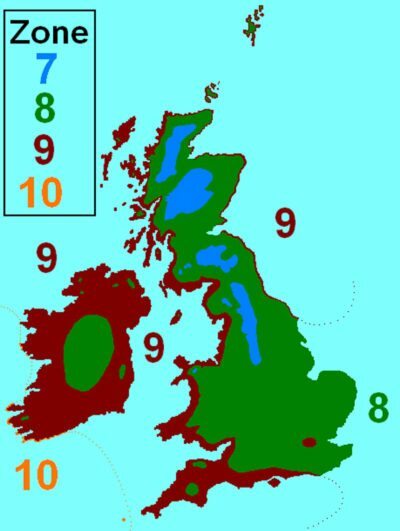 Most of the United Kingdom is located in USDA zone 9, although climates as chilly as zone 8 or as mild as zone 10 aren’t uncommon. As a general rule, the UK is marked primarily by cool (but not frigid) winters and warm (but not scorching) summers. The UK enjoys a fairly long frost-free season that extends from early spring to late autumn. Keep in mind that UK zones and USDA zones are intended to serve as guidelines only. Local factors and microclimates should always be taken into consideration.